From transparent handbags to utility pants, the latest crop of spring styles to surface are anything but ordinary. 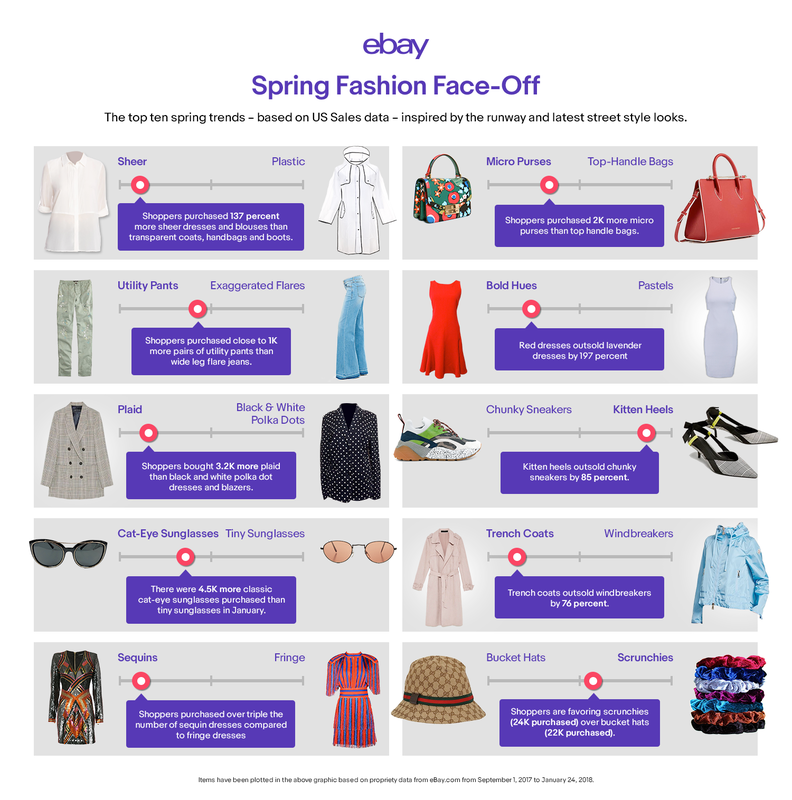 Based on an analysis of US sales, eBay’s Spring Shopping Report, released today, showcases the must-have spring trends influenced by the runway and street style looks. The new report uncovers this season’s top 10 fashion trends and which emerging styles shoppers are adding to their closets. 1. Sheer defeats plastic: From tulle to PVC, this season’s emerging, coolest fabrics are becoming crystal clear (literally). Since September, shoppers purchased 137 percent more sheer dresses and blouses than transparent coats, handbags and boots – despite the fact that 2017 sales for transparent accessories increased by 41 percent year-over-year. 2. Micro purses beat out top-handle bags: While the top-handle bag has been spotted among the street-style crowd over the past few months, eBay found that shoppers are urgently down-sizing to micro purses. December 2017 sales for micro purses increased 38 percent year-over-year, and in the months between September ’17 and January ’18, shoppers purchased 2K more micro purses than top-handle bags. Trending styles include fun florals and statement colors. This spring, less is more! 3. Functionality is preferred over exaggerated flares: Sales of utility pants have been increasing in popularity – even surpassing sales of flared jeans. Since September, shoppers purchased close to 1K more pairs of utility pants than wide leg flared jeans. During the same time-period, sales for utility pants increased by nearly 20 percent year-over-year. 4. Bold hues outplay pastels: While pastels are expected to be omnipresent this spring, the trend has not yet reached its tipping point as shoppers are preferring bright, bold colors like yellow, blue and red. Bold hues were also seen in prints from mixed florals to check patterns. Last year, there was a seven percent increase in year-over-year sales of yellow dresses leading to the rise of Gen-Z yellow. Since September, red dresses outsold lavender dresses by 197 percent. 5. Plaid takes front row over black & white polka dots: When pitting polka dots against plaids – the most classic of all prints – the latter takes the cake as 2018’s most sought-after print. Since September, shoppers bought 3.2K more plaid than black and white polka dot dresses and blazers. 6. Kitten heels reign over chunky sneakers: New takes on these classic styles went toe-to-toe. Last year’s sales for chunky sneakers, from the Balenciaga Triple S to the Adidas x Raf Simmons Ozweego III, increased 30 percent year-over-year. However, since September, kitten heels, from Kate Spade to Tory Burch, outsold chunky sneakers by 85 percent. 7. Cat-eye sunglasses trump tiny sunglasses: While tastemakers coast-to-coast have been sporting tiny shades, shoppers seem to prefer the more classic cat-eye style. Last year, there were eight cat-eye sunglasses purchased every hour on eBay. In January 2018 alone, there were 4.5K more cat-eye sunglasses purchased than its slimmer and somewhat edgier cousin. 8. Trench coats outsell windbreakers: These two classic coat silhouettes took on a sophisticated edge on the runways, but shoppers are gravitating toward the more glamourous of the two as they prepare for April showers, with sales of trench coats outselling windbreakers by 76 percent since September. Modern twists on the classic trench style this season include embellished florals and unexpected colors. 9. Sequins outshine fringe: Sequins and fringe – two styles that seem to transcend the test of time – were spotted all over the runways in September, and eBay data shows that shoppers are favoring one over the other. Since September, shoppers purchased more than triple the number of sequin dresses and skirts than fringe dresses and skirts. 10. Scrunchies top bucket hats: These two accessories got a modern update for the Spring runways. While both are poised to reach their tipping point, shoppers are favoring scrunchies, also known as hair clouds according to the Danish fashion set, (24K purchased since September) over bucket hats (22K purchased since September). Notably, sales for scrunchies increased by 12 percent from September to October 2017. With a pair of women’s shoes purchased every six seconds and a handbag purchased every 11 seconds, eBay’s breadth of sales uniquely reflects the latest trends and in-demand fashion brands that shoppers are coveting the most.2 eBay is making it easier for inspired shoppers to find fashion items from anywhere, anytime using artificial intelligence and machine learning technology. From Image Search to Find It On eBay, shoppers can use pictures instead of words to find what they’re looking for from eBay’s catalog of 1.1 billion items – a majority of which are new and available to buy now. For more, visit eBay.com/fashion and follow @eBayFashion on social. 1 eBay’s Spring Shopping Report is based on US sold items on eBay.com from January 24, 2016 to January 24, 2018. 2 Data collected reflects frequency of product purchases via mobile on eBay US in Q4 2017.